Starting Tuesday, January 9th at 4:30PM Pacific/7:30PM Eastern, and for the next two Tuesdays after, join me for this 3 week master course that you can attend via phone or computer. Even if you cannot attend live, you’ll receive the recordings of each class and can listen at your leisure. You can also send questions via email that I’ll answer during the classes. 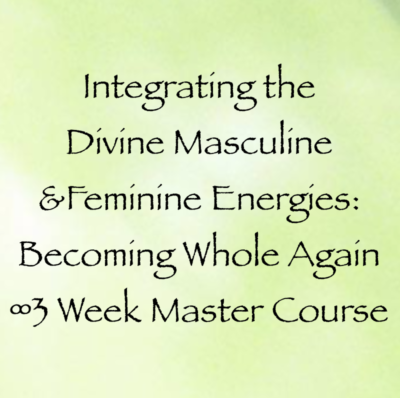 Week 1: We’ll explore what the Divine Masculine energy is, what the lower masculine energy is, and I’ll channel The Pleiadian High Council of 7 on how to activate our Divine Masculine energy and how to use it to create our reality. Week 2: We’ll explore what the Divine Feminine energy is, what the lower feminine energy is, and I’ll channel The Arcturian Council on how to activate our Divine Feminine energy and use it to receive all that we’ve created. This is a 3 Week Course! Starts Wednesday, November 29th at 4:30PM Pacific/7:30PM Eastern. (Weeks 2 & 3 will be the following two Wednesdays, December 6th & 13th). 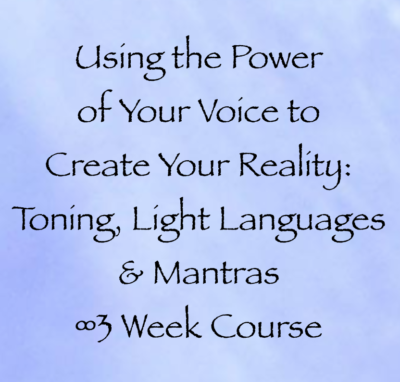 In this course, I’ll be teaching and channeling on the topic of how you can use your voice to create your reality. I’ve experienced the power of toning, speaking light languages, and speaking mantras in my own creation process, and I can say that they have without a doubt brought me more of what I want to experience in my world. In week 1, we’ll explore how you can use the power of your voice to make tones and sounds. These tones and sounds will carry your intentions out into the universe, where they will merge with higher frequency energies and help you create the experiences you want to create. I’ll also channel The Pleiadian High Council of Seven on the topic. 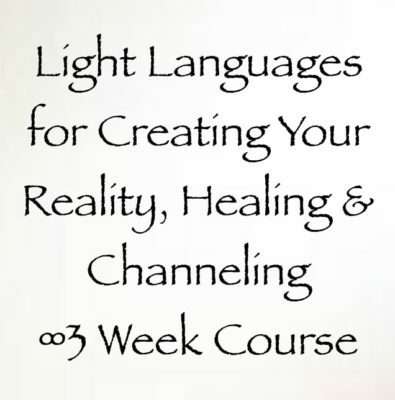 In week 2, I’ll be teaching you about light languages, what they are, how you can speak them, and how to use them to create your reality. There’s no limit to the number of light languages you can speak, and they go beyond the mind, speaking to your soul directly. Then I’ll channel The Arcturian Council, and they’ll speak about the power of light languages and how to use them effectively in your creation process. 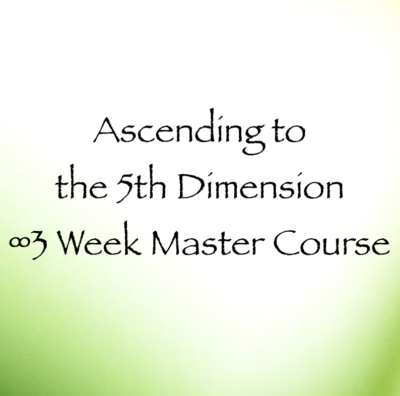 In week 3, I’ll be teaching you how to use mantras to create your reality. Mantras must be felt, in addition to being spoken, and I’ll make sure that the mantras we come up with in this course are the ones that will be more effective than any others you’ve used in the past to change your life and your experience of life. Then I’ll channel The Creators, and they’ll speak on the topic. This 3 week course begins on Monday, Oct. 30th, and continues for the following two Mondays (Nov. 6th & 13th). Each class will begin at 4PM Pacific/7PM Eastern. I’ll be covering three main topics relating to our physical mind. In week one, we’ll be exploring the art and practice of meditation. I’ll also lead a meditation during that first one hour class. 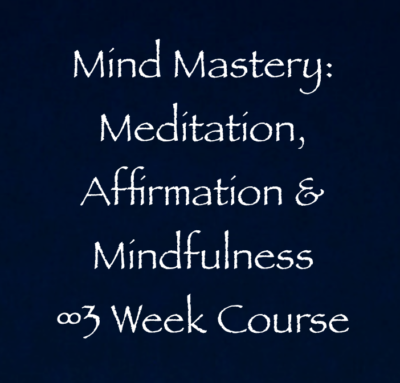 In week two, we’ll explore the power of affirmation, mantras, and positive thought. How can we utilize these tools to create our reality and to live a better life right now? That’s what we’ll be focusing on in week two. We’ll definitely be doing some speaking aloud of affirmations, mantras, and positive thoughts, putting theory into practice. In week number three, I’ll be discussing mindfulness and its practice in our daily lives. Mindfulness is completely underrated as a source of ease, appreciation, and creation. I’ll offer some practical ways to bring more mindfulness into your spiritual practice. In this three week course, which begins on Saturday, March 24th at 4:30PM Pacific/7:30PM Eastern (and for the next two Saturdays), I will be covering all topics related to having a physical body. These are intense times for our physical bodies, and we must give them what they need in order to have an easy and joyous transition to the 5th dimension. 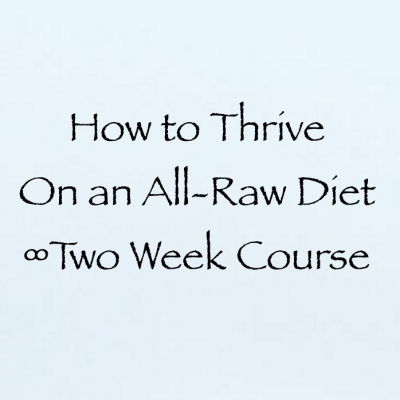 Each week will cover a different topic: Health, Vitality & Ideal Body Weight will be the three main topics covered. And ascension symptoms will also be included in the teachings. I’ll channel a different collective each week (The Creators, The Pleiadians & The Arcturians) to get their take on the subject as well. 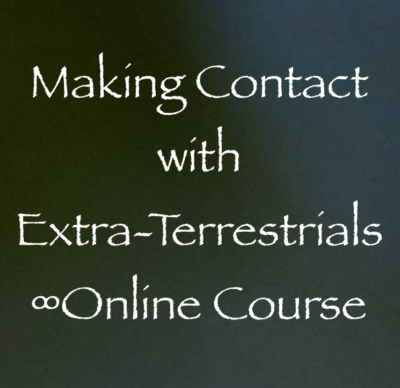 This course begins at 4:00pm Pacific/7:00pm Eastern on Tuesday, February 26th, and will also convene on the next two Tuesdays that follow (March 5th & 12th) at the same time. 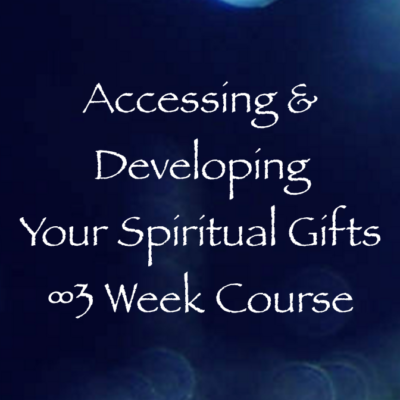 In this 3 week course that you can attend via computer or phone, I’ll teach you how to access and develop spiritual gifts such as: clairvoyance, intuition, hands on healing, sound healing, channeling, speaking light languages, and animal communication. You will learn how to access these gifts through processes and exercises that I’ve created. Next, I’ll teach you how to practice applying your gifts so that you can help yourself and others. It doesn’t matter what your current skill level is…you will benefit from taking this course. Also, you don’t have to attend any of the classes live in order to benefit from all that I’ll be sharing. You will receive a recording and a replay page so that you can attend the course at your convenience. And if you cannot be there live and have questions, you can email them in, and I’ll answer them during the live sessions. You’ll be able to hear the answers on the recording. Join me! Saturday, April 14th at 3:00PM Pacific/6:00PM Eastern, and for the next two Saturdays after, join me on a journey that will result in your feeling more connected than ever to your spirit guides, higher self, oversoul, and any other high frequency beings (like angels, archangels, and ascended masters) that you want to connect with. 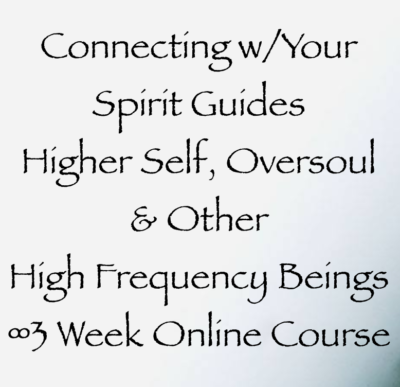 Each week I will lecture on how to connect with these beings, plus I will guide you through meditations, exercises and processes to get you feeling fully connected. Starting Thursday, May 2nd, and for the following two Thursdays at 3:30 pm Pacific/6:30 pm Eastern…In this three week course, I’ll teach you everything I know about light languages (light languages are known by some as “speaking in tongues”). You’ll learn how to speak them, what they do for you and others, and how to use them for the purposes of healing, creating your reality, and even verbal channeling. We will all speak our own unique light languages during the course, and you’ll have the opportunity to speak for different ET races and non-physical collectives. But don’t worry. You won’t have to speak your light languages in front of anyone else in the course. We will also write our light languages out on paper and absorb the coded information they bring. Do you know what I love best about speaking light languages? There’s no right or wrong way to speak them, and they don’t have to make any sense to us. They are meant to activate us…not to be understood by our very limited minds. If you cannot attend because you’re in Europe or some other part of the world that is sleeping at these times, no worries. You can get all the info through the recordings and replay pages I’ll send out after each hour-long class, listening when you have the time and energy. You can also ask questions via email, and they’ll get answered during the next class session. Join me! 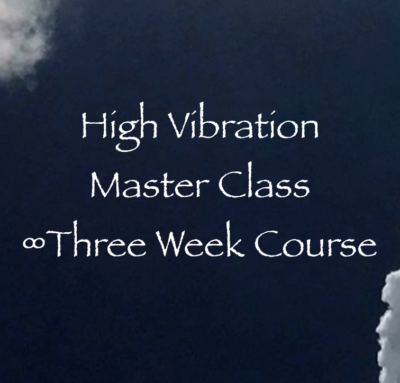 This three week course will be taught by me & the beings I channel. I’ve learned a LOT of tricks on how to find, hold, and raise vibrations over the almost 6 years that I’ve been eavesdropping while channeling my guides. In addition to telling you about how I’ve applied the teachings I’ve channeled, I’ll also channel a different collective at the end of class each week – The Creators, The Arcturian Council, and The Pleiadian High Council of Seven will all offer their insights and support. I’ll teach you all I’ve learned and applied to my life, including: how to find a vibration in your body, how to hold it, expand it out, and create your reality with it. Each class will be one hour long, and we’ll utilize tools like breathing, toning, and visualizing to get our vibrations up and up for good! Join by computer or phone. I love teaching this! If you cannot attend live on one or any of the days of the class, not to worry! You’ll get just as much out of it by listening to the recordings, and you can submit questions via email in between classes. Join us!